"I love dieting," said no one ever. But many on the ketogenic diet (a diet of low carbohydrates, moderate protein, and healthy fats) say they lose weight and have more energy than ever before. In The "I Love My Instant Pot" Keto Diet, Sam Dillard fuses the hottest diet trend with the hottest kitchen appliance in 175 fast and easy low-carb, high (healthy)-fat recipes everyone around the table will love. Dillard covers the basics of a ketogenic diet and cooking with an Instant Pot, but quickly dives into the meat of the book - the recipes. Chapters cover every meal of the day and then some (yes, this "diet" includes snacks and desserts! ): Breakfast, Soups and Chilis, Appetizers and Snacks, Side Dishes, Chicken Main Dishes, Beef and Pork Main Dishes, Seafood and Fish Main Dishes, and Dessert. Start your day with a hearty Greens Power Bowl adorned with soft boiled eggs and sliced avocado. Make your own healthy bone broth or seafood stock to use as a base in the Spicy Bacon Cheeseburger Soup or Lobster Bisque. The Appetizers and Snacks chapter is a dip-lovers veritable feast: nosh on a Creamy Artichoke Dip or the classic crowd-pleasing Hot Crab Dip. In less than 20 minutes you can make cheesy Jalapeño Poppers and a Quick Queso. Each recipe includes a nutritional breakdown making it easy to track your macronutrients throughout the day. Grab your Instant Pot and a copy of "I Love My Instant Pot" Keto Diet recipe book and let's get cooking. 1. Sprinkle seasonings on chicken breasts. Press the Saute button and add coconut oil to Instant Pot®. Saute chicken for 3–5 minutes or until golden brown. 2. Remove chicken and place into glass baking dish. Pour water into pot and use wooden spoon or rubber spatula to make sure no seasoning is stuck to bottom of pot. 3. Place spoonful of ricotta onto chicken pieces. 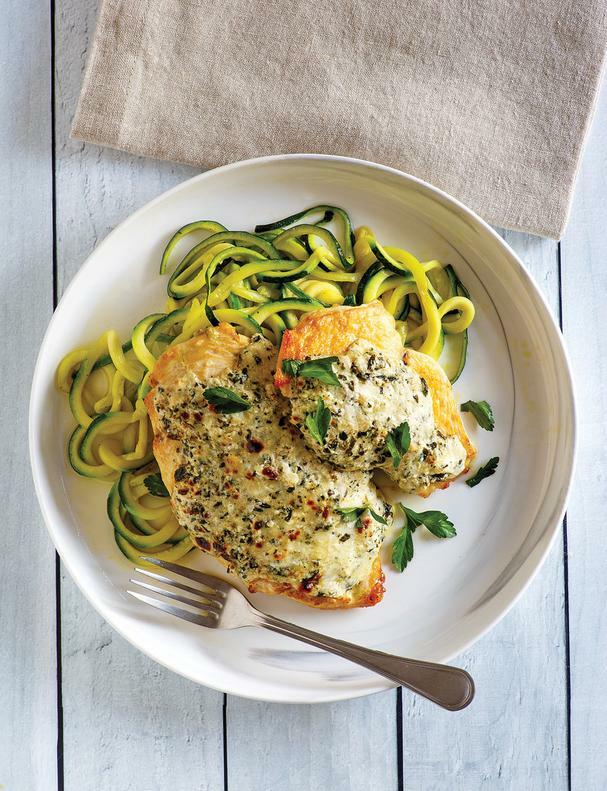 Pour pesto over chicken. Sprinkle mozzarella over chicken. Cover with foil. Place trivet into Instant Pot® and carefully put baking dish on top. Press the Manual button and adjust time for 20 minutes. When timer beeps, allow a natural release. Serve with chopped parsley if desired. 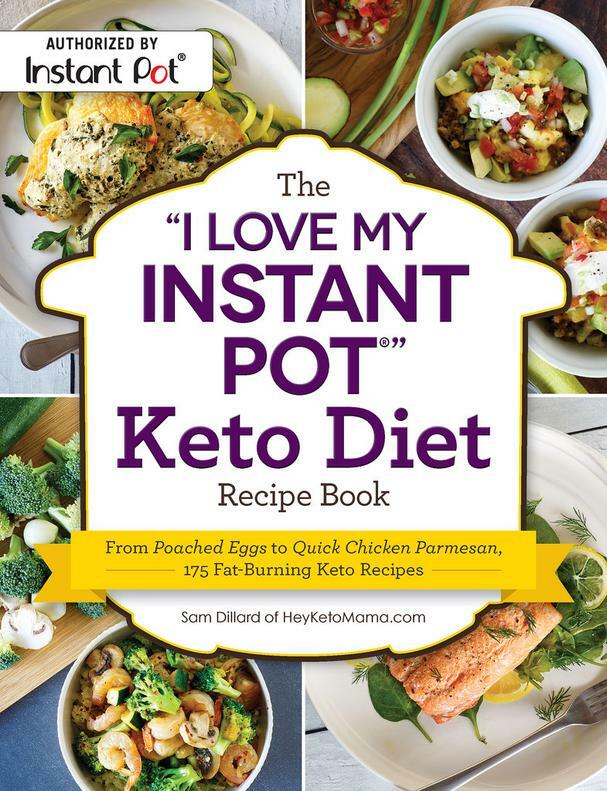 Excerpted from The I Love My Instant Pot® Keto Diet Recipe Book: From Poached Eggs to Quick Chicken Parmesan, 175 Fat-Burning Keto Recipes by Sam Dillard (HeyKetoMama) Copyright © 2018 Adams Media, a division of Simon and Schuster. Used by permission of the publisher. All rights reserved. Interior images by James Stefiuk.